SportSpar: Because Passion doesn't have to be expensive! You love sports? We too! That's why we have set one main goal for us at SportSpar: To support your power by favorable sportswear! Whether you like playing football or prefer to be active otherwise - with the right equipment success is guaranteed. Our young team gets you moving! The team of the big brands harmonizes well with that of the small prizes. 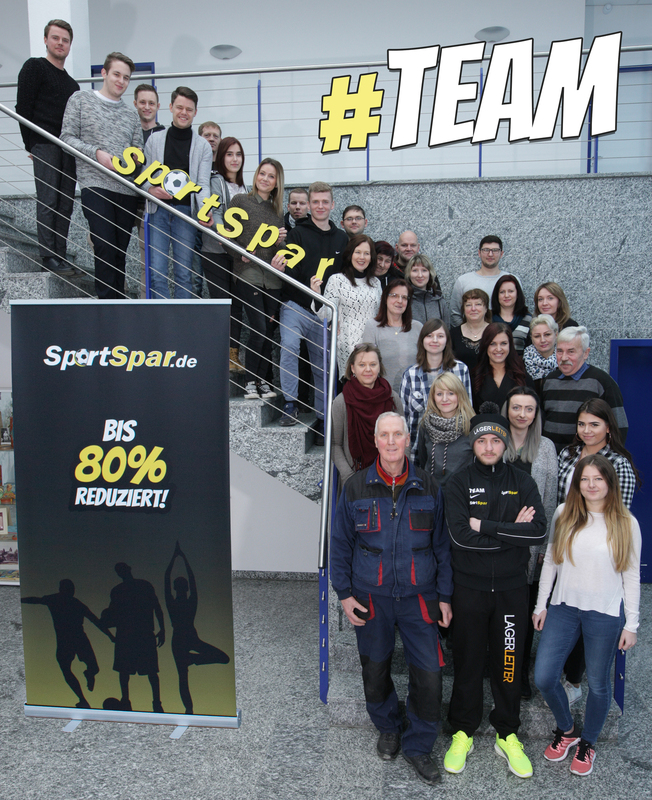 Behind the scenes are young active sports lovers who founded the SportSpar GmbH in August of 2010. In the meantime, we have moved up from a divisional provider to one of the leading German companies in the e-commerce league. From successful away games such as the sale via Amazon and two Ebay shops, the online shop SportSpar.de was launched on July 12th, 2011. The offer at SportSpar is mainly characterized by two distinctive talents: It's variable and it's cheap. The spectrum ranges from high-quality sports shoes over streetwear to everything you need for your favorite sport - whether basketball jerseys, handball shoes or golf clothing. Our constantly changing assortment offers the latest sports fashion at absolute lowest prices. How we can make this sporty fair move possible? Quite simply: We sell phase-out models, remainders and surpluses at outlet prices. These brands not only stand for prestige, but also, in particular, for optimal processing, high-quality materials and innovative technologies. Of course, all of our branded products are brand new and officially licensed items. We guarantee first-class quality - only this high standard plays in our league. Because the sport is already physically demanding enough, our shop works even more comfortably. All article are clearly arranged according to types of sport and then divide into their respective sub-categories. That is how passionate football player will immediately find what they are looking for in our shop: from the socks to referee and keepers equipment. If the sports shoe ever press somewhere, our customer service will provide you with advice and support. Our corporate philosophy commits us to do so, because we are only satisfied when you are satisfied. More than 75,000 enthusiastic and convinced customers from 20 countries in the last three years: This record of success characterizes the SportSpar GmbH. Who we are? A professional online dealer, where you save 50% of the original price and more - and get high quality, premium sporting goods and first-class service!